I’ve been having a lot of fun with the set of the building through a series of classes and private lessons. It’s about time to put it away and move on to the next thing. This all came to me in a dream, don’t you know, when I was working with Wayne from Wisconsin last week. The focus of the dream was the wall of jumps around the outer perimeter with the equipment to the inside. The pipe tunnels provided for considerable discrimination work (hence the “Roller Coaster”). Today’s lesson was with Katie & Dave who were here for a weekend resort visit. I rotated all the jumps for square presentation (compared to the previous “serpentine”) and tweaked the tunnels a bit to work in complimentary fashion with the new presentation of the jumps. As always the focus of the lesson is revealed by the foibles of dog and handler as they attempt to solve the numbered riddle. 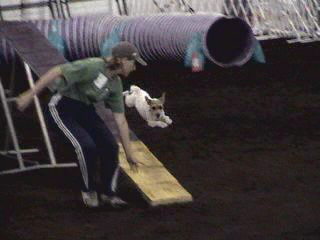 This set of the floor is full of potential topics: a basic lead out; how the attitude of the handler’s arm conveys either obstacle focus or handler focus; pre-cuing turns; and the simple discipline of timing movements. I suppose I have to sit down in the afternoon and write down a bunch of my notes from the week because there’s all kinds of good teaching/instructing notes from the very basic to quite advanced. I will be leading a series of modular clinics on the two days prior to the Petit Prix once again this year. We’ll be focusing on killer strategies for the games of the 2010 Petit Prix and, as usual, handling fundamentals for TDAA spaced courses. This will give the clinic participants an opportunity to get comfortable in the venue and on the equipment that will be used in the Petit Prix. To reserve a spot in one or all of the Petit Prix warm-up workshops contact Marsha Houston at MarshaHouston@hughes.net. Who is depicted by this cartoon? And what is the context of the caricature? I will be leading a series of inexpensive modular clinics on the two days prior to the Petit Prix once again this year. We’ll be focusing on killer strategies for the games of the 2010 Petit Prix and, as usual, handling fundamentals for TDAA spaced courses. This will give the clinic participants an opportunity to get comfortable in the venue and on the equipment that will be used in the Petit Prix. 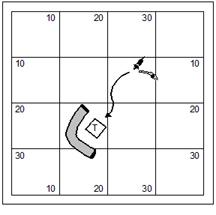 This is a standard course designed to explore handling for the 270° turn. Somewhat serendipitously the course features several “pull-through” challenges and, evidently, taunting discrimination challenges with the dog working at nice speed. We will study how to use our distance skills to solve fundamental handling riddles. That’s the theory anyhow. A study of the dog’s path shows a path of modest flow. The two tightly wound circlets are moments on course at which the dog is tucked into the tunnel under the contact obstacle. The dog’s path also shows no fewer than three hard-aback peaks, two of which represent a “pull-through” moment that will test the handler’s ability to get in a control position. A study of the dog’s path is always useful. The harder the turn/change of directions the greater the drag on the dog’s ability to maintain a top working speed. It’s just a matter of physics. A greyhound race-track is a huge oval bigger than the outside track of a football field. This is calculated to create no drag on the dog’s ability to work at full speed. I don’t think a greyhound would like this track much. What university did this fellow attend? Do you remember what it was like when you were 15? A year is a measurement of time that stretches into forever infinity and time crawls with slow deliberate measure. The idea of patience is contrary to the very pace of life. I guess it’s no real wonder that most kids are such terrible dog trainers; because they have no patience and no concept of “the long view”. We need to be deliberate and measured in training a dog. I’ve said for a long time that I know exactly how long it takes to teach a dog a thing. It takes as long as it takes. Along the way I’m an advocate of keeping statistics on success. When I was teaching my boy Kory “left” and “right”, for example, I was thrilled and pleased when his success rate hit 80%. This was fully four months into his training on these absolute directionals. And yet in another two months, he was up around the 95 percentile range. It’s a bit hard to tell in this drawing… but there are two sets of weave poles… with only two poles each. I have some of these laying around when subscribing to the two-by-two weave pole training method. It’s also an obstacle that doesn’t take much floor-space (if you want to count tail-wagging-the-dog benefits). I’m working with Wayne (from Wisconsin) all this week. Our time together is dedicated to distance topics. We’ve pretty much decided that his dog is faster than he is so working at a distance is working smart. But it requires some training of both the dog and handler to accomplish. We’ve been having a bit of a problem ride with a basic send to the pipe tunnel. Yesterday I was kidding Wayne about assuming a posture and energy of movement rather like Boris Karloff’s rendition of the Mummy when making a send. His young dog Zeke immediately turned off the tunnel and into stark handler focus. An interesting thing happened while we were working through a Front Cross on the landing side of jump #4… Wayne gave pressure to jump #5 and Zeke zipped over the jump and on to the pipe tunnel at #6. It amounted to his most impressive send to the tunnel in a couple days of work. We had to stop and study the moment and try to figure out what cue was provided by the handler that facilitated the send to the tunnel; and indeed what it was in the handler’s intention to send to the tunnel that failed. I have to sidetrack for just a moment. This is a picture sent to me by Beth Bowling, running her young dog Skye. In a seminar in Cincinnati recently I was talking about how the handler should avoid bending over on the dismount of a contact obstacle because the dog doesn’t see so much the pointing as the sudden thrust of the handler’s shoulders forward; the dog takes the thrust of the shoulders as a cue to race, or accelerate. So, the correct posture should be for the handler to hold his shoulder’s back on the dog’s dismount of the dogwalk. Anyhow, Beth sent me the pic because it was kind of a funny affirmation of my teaching point. Now… back to Wayne. What we decided in breaking down the difference between the intentional send (picture Boris Karloff playing the Mummy here)… versus the incidental send with the handler scooping up out of a Front Cross and accelerating forward; is the that set of the handler’s shoulders is quite different. We tested the notion… and for about the next hour Wayne was sending Zeke on to the pipe tunnel at ripping speed from impressive distance. 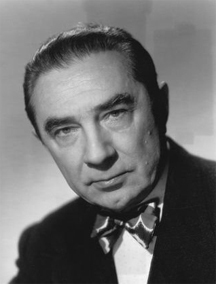 Who is this actor? And for what role is he most famous? As it happens as I set up the equipment for the exercise I’d designed yesterday for “Get Out” training I was a bit whimsical in the effort; substituting one jump for the teeter and adding a tunnel wrapped around the table to provide a flow option from the teeter. What I discovered here is that Kory pretty much didn’t see the table and opted for performance of the pipe tunnel instead, when I was sending from any distance at all. And so it occurred to me that this was a great dog training opportunity. I’ve had as one of my missions to teach my boy the “names” of the obstacles. While this might seem obvious the complete truth of the matter is that very very few dogs actually know the names of the obstacles and are merely doing those obstacles that are presented to them by the explicit movement of the handler. I have a powerful interest in teaching my boy to work at a considerable distance from me because, if you must know, I am nowhere near as fast as he is and I cannot rely on handling alone to solve all riddles. But what I’ve long suspected is that the dog derives as much word recognition from the back of the word as they do from the front. And so “Table” and “Tunnel” are treacherously similar sounding words. So I’ve adopted the habit of using the command word “Table Up!” as my cue; and it frankly sounds a lot more like ta-blup’ than anything more coherently described. Well “Table Up!” sounds distinctive enough from “Tunnel”. And frankly I’ve considered changing the cue for “Tunnel” to “Get In!” Now, we have some differentiation! Just a bit of anecdotal evidence; we had two dogs in our house, one named Hazard and one named Wizard. Well, if you were to call one of them then both of the two “zards” would come running; at least that was true before our old boy Wizard went deaf on us. 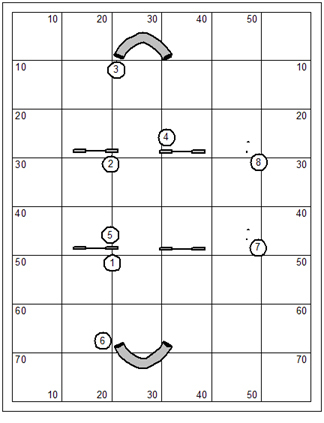 Named obstacle training is really quite a simple matter. I’ve got Kory’s favorite toy in hand and I give him the cue “Table Up!” Each time he goes into the pipe tunnel I react with stony silence and no offer whatever to throw his Frisbee or engage in a game of tug. But if he should get up on the table, then he earns an enthusiastic verbal marker, a toss of the Frisbee and a game of tug to boot! On the simple presentation as shown in this drawing it took nearly 10 minutes before he sorted out which performance earned the reward and which the unrewarding silence. As we practiced the exercise I gave Kory no help whatsoever; not so much as pointing at the correct obstacle with hands or feet. I was generally facing in the direction of the two obstacles. The next step is to give the approach a little flow. You’ll note here that the dog’s trajectory over the jump pretty much aims at the pipe tunnel; though I’ll ask for the Table because we’re not mixing them up yet. Before make the exercise more advanced I’ll want to have considerable success with the notion that he knows which obstacle is the table. A more advanced test will be to build flow. In some dogs (I’m talking Kory here) the excitement of good flow will excite his sense of earnest mission without particularly engaging the gears of his brain. Think about it from the dog’s point of view… when you’re on a “ripper” the table just doesn’t make any sense. And yet the flow will lead us to an important training opportunity that is resolved exactly as were the earlier steps. If he gets on the table he will have a happy handler full of reward; if he goes in the tunnel he’ll have a silent glum handler with no offer of reward. I’ll leave it to my clever dog to figure out exactly what it is that I want when I say “Table Up!”… and what he has to do to earn enthusiastic praise and reward with his favored toy. 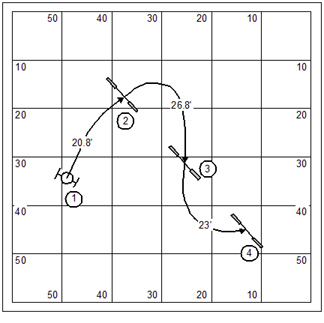 The topic “Named Obstacles” was introduced in the Jokers Notebook ~ Dog Agility Distance Training ~ Issue #0 ~ August 2010. Details below. We are seeking to make a start to a new AKC club representing SE Ohio (from Athens to Zanesville to Marietta; and surrounding areas). We invite you to become involved as charter members. Our vision of the club at this time is to affiliate with the American Kennel club and to engage in a wealth of AKC programs including: Conformation, Herding, Tracking, Agility, Obedience, and as many of the specialty classes as warranted by the diverse interest of founding members. If you would like to become involved contact me at: BudHouston@hughes.net and leave your phone number and address. I’ll get back in contact when the list of interested persons reaches critical mass. Who is the infamous digger pictured here? And, for what literary work is he best known? I have a couple days to myself. I thought I’d get out in the building and train my dog. Imagine that! I’m especially interested in teaching Kory a solid “Get Out!” A lot of people use the words; but it strikes me that not a lot of them actually teach a performance; and so the dog is more likely following their movement at the moment of delivery rather than responding to a command for performance. 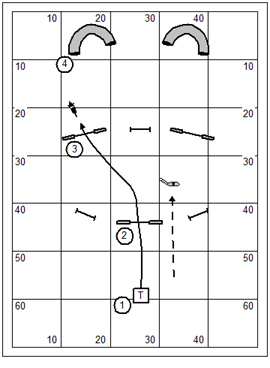 I’ll no doubt incorporate this training sequence as a part of our Sunday mini-clinic. There are lots of things you can do with it aside from teaching a “Get Out”. Kory learns things so fast that it’s scary. We did some stationary “Get Outs” positioned forward of the wingless dummy alongside jump #3. And he got that pretty good. Then I incorporated a straight line (towards the wingless dummy) over jump #2. And then we backed up to the table and did it again. Then I repeated the whole series as a mirror image exercise, going to the right instead of to the left. I expect to continue reinforcing the skill in two-a-days over the next ten days. I’d like very much to trust the “Get Out” without an intrusive step. How many points does it take to qualify at the GIII level in the game Double Dog Dare Ya? What is the more common name for this game? The real beauty of a serpentine in dog agility is the efficiency with which the dog might negotiate jumps presented in a flat line insinuating a nearly weaving movement from jump to jump. However, the beauty of the performance can be lost when the approach is set at such an angle that a “wobble” is introduced. The physics of the dog’s movement demand adequate room in the turning radius for the dog to make a nearly 180° turning transition. 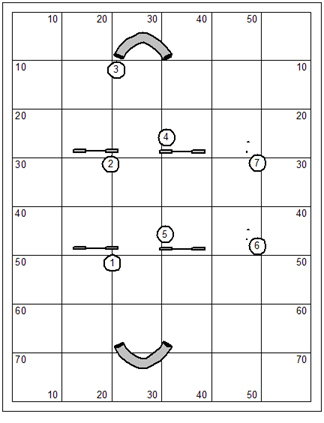 Mind you I am discounting for the moment the capacity of the handler to make a presentation of jump #2 (in this illustration) that pre-cues the turn from jump #2 to #3. 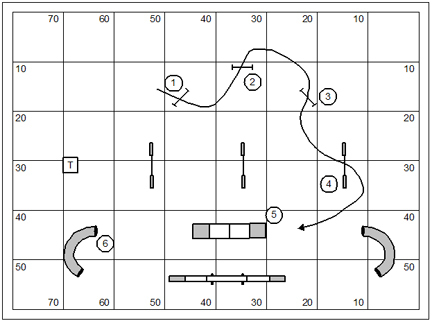 It might very well be possible for the handler to draw the dog into a much more efficient turn. But you’ll just have to trust me that this is the exception, rather than the rule. You can see in this drawing that the dog’s movement begins to flatten out. But it would take a serpentine of five jumps before the efficiency of the dog’s movement between jumps is as neat as can be. Not only is the dog’s path bigger and wider; but there will be a degradation in the dog’s speed in the hard-aback turn. 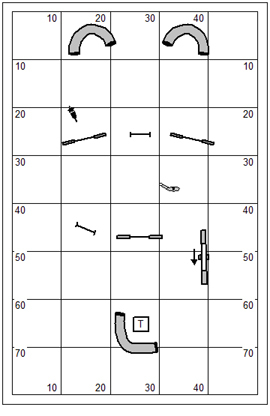 The course designer might be a bit more thoughtful in the presentation of the serpentine. 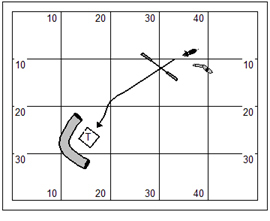 If the dog’s angle of approach is more at 30° then the consequential degree of turn will be more at 30° as well. And there is no need to degrade the speed of the dog as there will be in a pre-cued turn or a hard-aback turn. What do the authors of Brave New World, The Chronicles of Narnia, and the presidential Inaugural Address 1961 have in common? It has been three weeks in a row of agility trials. I went into the weekend pretty much figuring that I was about done with my girl Hazard. Her motivation has been an issue as she often turns into a worried little girl, what with axe murderers on the field and big dogs around ring-side ready to pounce on her at any moment. And so, I went into the weekend just not caring very much. I’d just go out on the field with her and have a bit of fun. Whatever happens, happens. And down the road we’ll cut down on trialing expense by leaving her at home. So the weekend was to be about Kory. And indeed, Kory didn’t really disappoint. He finished both his NA and NAJ titles. The last jumpers run of the weekend was especially sweet as we killed a tight & technical Novice course in 18 seconds and 05 100ths. Hazard, as it happens, earned three double-Qs and a Q in FAST on the weekend. Yep, that’s right. She went 7 for 7 which is pretty cool. She was happy, barky, and having fun. Now, I think back in time about 18 years. I was running Pepper, a lack-luster Sheltie girl who was always asking the question… “why am I doing this?” and Winston the Wonder dog, also a Sheltie and a relentless little speed demon. I was in a race with Ray Weick and his magnificent little miniature Schnauzer Megan Deerchaser to be the first dog in Arizona to win the USDAA MAD title. With Winston it was always go go go! We were intense and hard-working. But with Pepper it was just the warm-up tracer round. I just didn’t care very much because I didn’t have high expectations. So… who was the first dog to win the MAD? Yeah, you guessed it. It was Pepper. It’s an interesting psychological play that approaching the game of agility without pressure either on self or on the dog; and without heaping expectation enhances our chances for success. I’m reminded with my old boy Bogie how his Q rate dropped when we got near to the points for a MACh. It’s all the same thing. Pressure is corrosive and terrible pressure. Okay, I have a lot of work to do this week, and not much time to do it. I hope to write to my blog each day. The picture below depicts a strategic setting of pieces for a board game. What is the name of the game? Okay… I’m finally done with the #0 issue of the Jokers Notebook. It has been quite a bit of work. 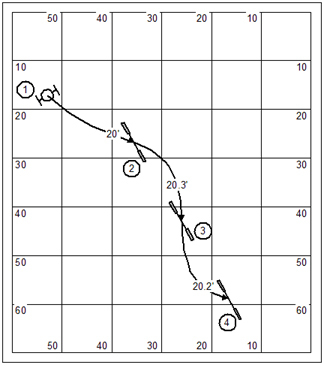 I’m hoping that this will be a highly regarded reference for distance training in dog agility. This is a unique publication of the Jokers Notebook; a single reference for the training steps that one might take for a young pup in the first couple years of the dog’s life. Issue zero of the Jokers Notebook is intended as a companion piece to all of the other Notebooks that we publish. 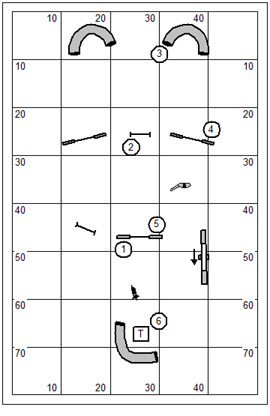 While an individual Notebook might detail training steps for a skill, this reference is intended to be a consolidated resource dedicated solely to foundation training steps. Our price $10.00; 126 pages. The drawing on the cover of issue #0 of the Jokers Notebook previously appeared on the cover of two Clean Run publications. What were they? I’m in Boot Camp mode with my students. I have to set something up for the Thursday evening class to work on some basic handling skills. At the same time I’m very interested in putting up a course of Masters quality in a small space. 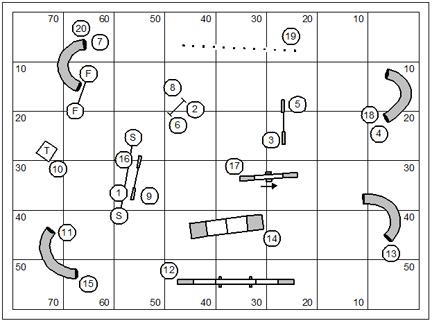 This is not an easy course design assignment. I want comfortable working room between the obstacles; I want Masters challenges; and I want flow. Also, being kind of lazy, I wanted not to move a lot of equipment around from the set of the floor from last week. And, don’t you know, I want to cram all of this in a ridiculously small space… 60′ by 80′. 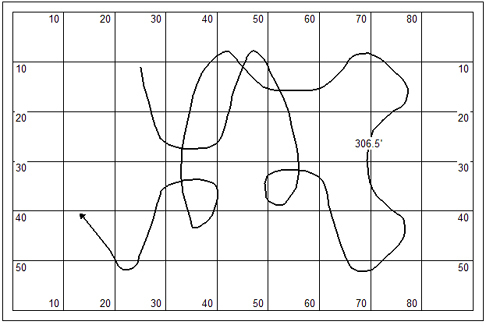 This is a course that measures 185 yards. And, I managed to stuff it all into a hard-sided box. There is in the course a high reliance on pipe tunnels. And, there’s a good reason for this. I have at least one student who absolutely cannot approach the performance of a pipe tunnel without turning her feet away from the approach (her toes curl up like the wicked witch of the East). This is a wonderful opportunity to give her a good workout on giving focus on the obstacle on which the dog is working. Frankly two or three of these pipe tunnels might have been jumps. But there is something about the pipe tunnel that inspires degradation in really basic handler discipline… and so the lesson shall be about pipe tunnels. I didn’t build into this course a lot of counter-side pipe tunnel discriminations except in very subtle fashion. That doesn’t mean we won’t be doing some counter-side pipe tunnel work in sequencing in this set of the floor. I had a really fun time this past weekend showing my pups down at Queen City. I went 50% qualification-wise (6 for 12); pretty much evenly distributed between the two dogs, one in Excellent (Hazard) and one in Novice (Kory). They are two completely different stories performance-wise. Hazard is a worried little girl and works at a worried pace. Though capable of much greater speed, out in the world it is a labor dragging her around the course. Kory is a study in explosive desire and a completely different kind of riddle, I can assure you. If the weekend taught me anything it is that I have some work to do developing the teamwork that is necessary to direct a dog in agility. It’s just information and I’m not dismayed by it. It’s just a fact. I’ve been so focused in teaching skills with Kory that I’ve probably not done enough in basic handling drills. And I’ll remedy that over the next few months. And I’m afraid the same is true in my relationship with Hazard. Marsha has been handling her almost exclusively for over a year. And I have to reassert my partnership with her. We’ve been testing the proposition that she is more worried when running with me than with Marsha. Well, maybe it’s more a matter that she feels safer (somehow?) with Marsha than with me. So I practiced things like carrying her into the ring and plopping her down just in the instant before we took off on course. It seemed to have fairly good effect on the weekend. Team is a thing that is earned through practice and competition both. I’ve felt it many times in my agility career; with Winston the Wonder dog; with Bogie & Birdie. And now I have it to earn again with Hazard, and to build from scratch with Kory. So many of us who’ve played this game have experienced the phenomena; when you first start with a dog you struggle and struggle and everything seems ungainly and impossible. But something happens over time that you each begin to understand the other. Eventually you become like an old married couple out on the floor dancing; each understanding every subtle movement and nuance of the other. It is an amazing transformation. I confess. This one’s going to be hard for most of you. Who is this fellow? 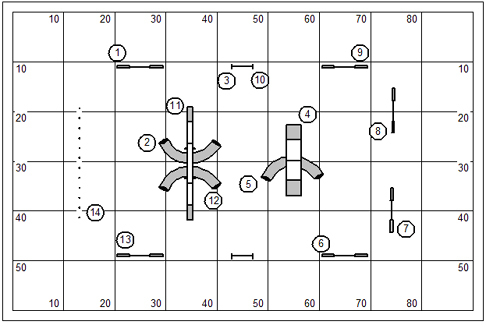 Based on the set of the floor I design a variety of sequences with which to challenge my students. I’m always keenly interested in problem solving skills in even simple sequences. It is a test of my own teaching. One of the sequences that I put up began like this. Four jumps arranged along an arc in what appears to be a serpentine. What I witnessed, from my own students, was a game attack on the “serpentine”; but not terribly artfully done because of the curious rotation of the jumps along the edge of the arc. 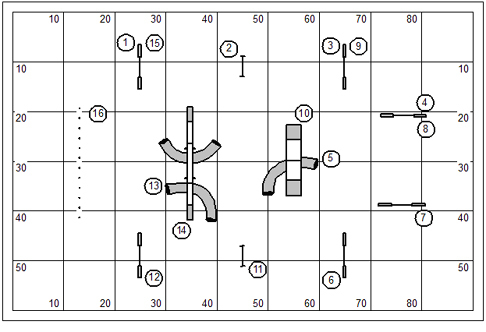 What I suggested to my students is that they visualize the four jumps as two sides of a box… lining up the first two neatly, and making a 90° turn to line up the second two just as neatly. The oblique approaches to the jumps is quite an advanced presentation for many dogs. 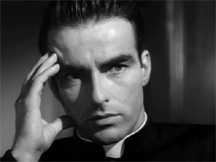 But what we found on the rerunning of the sequence is that the handling was simplified, clarified, and straight-forward. I’m on the road now with Kory and Hazard to show in a weekend trial with Queen City Dog Training Club in Cincinnati. I’ve swapped a day of seminar for entry fees and expenses. I don’t actually have a daytime job you know. So this is a great way for me to make the cost of showing my dogs affordable to me. The club has been terrific to me so far, putting me up in a nice hotel with a gift basket, and reserving a parking place for me at the trial site. I think I’m going work hard to give them a hell of a seminar day! I’ll let you all know how it goes with Kory, Hazard, and I this weekend. We have some performance details to work through with Kory. And I’m just no where near in a hurry with him and I really want to teach him how fun it can be. With Hazard, I just want her to be happy and run her best. What sort of pet did the female protagonist in the movie The Terminator own? What was the pet’s name? You are currently browsing the Bud Houston's Blog blog archives for August, 2010.